3 Day Wet and Wild Adventure. 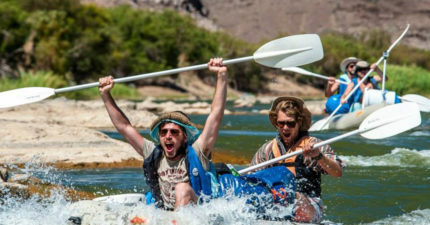 Our 3 Day Wet and Wild adventure is the perfect safari and river rafting combination. This is a full day of activity, experience, and safari. We will start our day at 09:00 am with a transfer to our rafting starting point. We will either make use of sit on top kayaks or inflatable two-person rafts. The selection all depends on the water levels of the Orange river on the day. 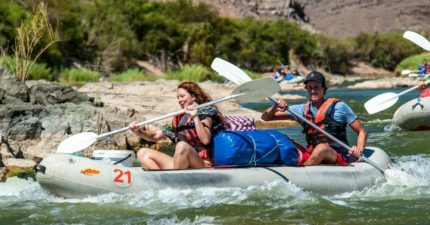 The morning on the orange river will offer some fast flowing water with beautiful scenery. The magnificent Birdlife adds to the surroundings. 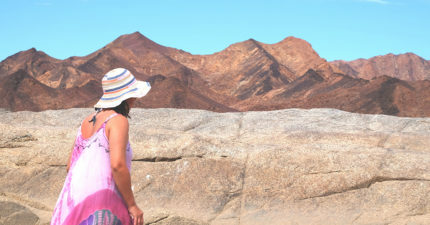 The Richtersveld is well known for rock formations and semi-precious minerals. The first part of our trail starts meandering down the ‘Great Orange’ river. During which you will be viewing an array of bird life, paddling and negotiating rapids while primarily being amazed at the setting, relaxing in the sun and cooling off with a swim in the river. After enjoying lunch on the side of the river, we make our way back to camp. At camp, you can relax while your guides are preparing dinner. Day two of the trail is into two parts. 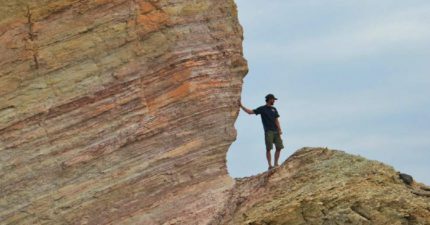 First, we will go for a guided hike in the Richtersveld, see striking rock formations and caves, and get to see what the Richtersveld has to offer up close and personal. The second leg of the day will take us on a thrilling 4×4 trail into the Nababeep Conservancy. Explore the geological wonders and diverse collection of fauna and flora, many of whom have adapted in different and unique ways to survive this desert environment. We once again leave the mountains behind and slowly make our way back to camp for a beautiful bush-style dinner under a magnificent star-studded sky, the perfect ending to an exceptional experience. The Richtersveld community reserve, namely the Nababeep community reserve is 3km from our base camp. We will be packing the cooler box and embark on our customised safari vehicle. The road is rough rocky terrain, and a car with high clearance is best. This part of the Richtersveld is home to some of the local indigenous succulents and fantastic rock formations. We explore the ‘halfmens ‘ and quiver trees, along with a variety of plants. This is an excellent opportunity to experience the only mountainous desert of South Africa. The desolation of this rugged desert will leave you speechless at the best of times. The ancient petroglyphs are always a great visit and allow for discussion and mythology of the Nama-Khoi people. Day 2 Full Day River Experience and wild camping Camping B.L.D. 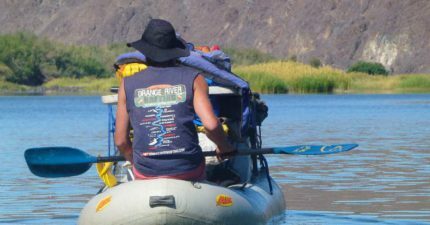 Day 3 3 Hour Paddle, Morning Hike and Afternoon Safari Acc B.L.D. Where does the wet and wild trip start & end? – The Growcery Camp. When does the trip start? – At 5 pm you need to check in at Reception on Day 1? What must I bring or pack on this trip? – You will receive a comprehensive packing list when booking. What is the youngest age on a trip like this? – We will suggest from 5 years and older. Will my vehicle be safely parked at the camp? – We guarantee the safety of your car. Can I select a vegan or vegetarian meal option? –We cater to dietary requirements of vegans and vegetarians. If I don’t eat anything, you suggest? – You are welcome to bring your selection of foods. Is this a malaria zone? –IT IS A MALARIA FREE ZONE. Can you suggest on route accommodations? We sure can make suggestions and reservations. Whatsapp: 0825753844 – send a message at first and select a time for returning your call. Park fees, conservation fees, entrance fees and transfer fees included. RATES INFO: Min 50% secures a reservation. The Growcery team will meet and greet you upon your arrival at the Camp. We suggest that adventurers should not be later than 5 pm on day 1 of your trail. This evening you will meet your guide for the wet and wild experience and receive a briefing on what to expect the next days while on your adventure. Dinner will id freshly prepared and served around the open fires at camp. A great evening of introductions and star gazing. Your Guide will brief you on what to pack and where to safely park your vehicles. Our day starts with some coffee and tea around 07:30 am and a hearty breakfast to follow at 8:00 am. Our transfer towards the starting point of our rafting trail will start at 9:00 – 09:30 am. We will transfer 14 km upstream from our camp and start our day exploring the orange river rock formations, birdlife endless mountain views. This river trail is a floating paddle and explores experience with a picnic style lunch. Mid-afternoon we will pass the growcery camp and collect our overnight bags before heading off to camp in the wild this evening. After setting up camp, we will go for a sunset hike overlooking the Richtersveld mountains. Our day will end around an open fire; star-studded night skies and some wholesome food prepared on an open fire. The evening is an excellent ending to an adventure day in The Richtersveld. Wet & Wild – Richtersveld explorer. Our morning will start with the sunrise and the sounds of the many birds along the Orange River. 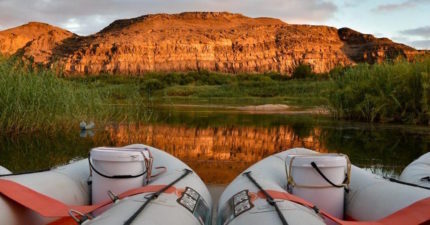 It is a relaxed morning and after a cuppa and a hearty breakfast we will start making our way back to camp with a scenic paddle along the Orange River. It is a great time to seek the malachite, pied and giant kingfishers. It is not uncommon to find jackal buzzards and fish eagles along the way. The Goliath heron makes an impressive sighting on the Orange River. Our arrival around lunch time at The Growcery will be met by a hearty Lunch and some leisure time after lunch. Our Richtersveld trail will start at 3:30 pm. 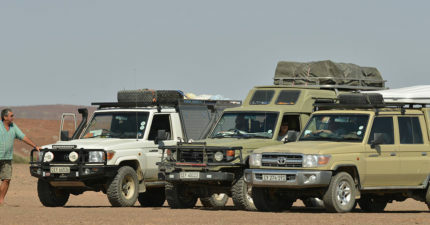 We will depart in our 4 x 4 safari vehicle and explore the fauna and flora of this mountain desert in the Northern Cape. Quiver trees, succulents and the “half mens plants ” are endemic to this region. A valley of desolation as we describe this journey. The 4 x 4 trail is the perfect way to explore the surrounding mountains and area with our 4 x 4 safari vehicle. This evening Dinner will be back at The Growcery Camp, and you will have bedded accommodation. Our morning will start with a cuppa and rusks before your adventure comes to an end. You depart camp after your cuppa and take home the memories of the Wet & Wild Adventure. Coffee / Tea and rusks this morning.